Charlie was on active service and his little sister waited for news in Africa. It was 1915 and nearly Christmas. The letter below was what went into the envelope eventually, and the Post Office then made sure that it arrived where it was meant to. Sorry I haven’t answered any of your letters. No time, too much work. I am enjoying myself awfully out here. I am now in a house all knocked down by German shells. But I have patched up this one room with sand bags and I’ve hunted around the houses around and found all sorts of things, chairs, pictures, tables, a bed which is a great luxury and a shelf and a curtain and this room, though only about the size of your room, is extremely comfy, and I have a fire going whenever I want one. I can only get wood to burn. There is one room upstairs that is whole and the stairs are still there, otherwise the house is a wreck, part of the roof is there. I used to sleep in the cellar only it was too stuffy so I moved today. It’s topping here. I make hot cocoa every night. I hope you will have a very happy Xmas. Charlie’s full name was Charles Furlong Wise and the letter was for 15-year-old Christabel in Rhodesia. Charlie survived the war and moved to California. * The UK population doubled between 1851 and 1914, and literacy rates rose. * In 1850 the Post Office handled 350 million letters – by 1914 the figure was 3.5 billion. * In 1913 in a rural town you could expect up to 12 deliveries a day – this was cut to one due to the war. * The charge for sending a letter through the post in 1914 was one penny. This had been the charge for 75 years. * In 1914, due to staff shortages, frequency of deliveries was reduced and discussion begun about raising charges. * The Post Office in 1914 was a highly developed communications organisation and was the world’s largest single employer. * The First World War took a huge chunk out of the Post Office’s staff – 11,000 had enlisted by 1914 and a total of around 73,000 by the end of the war. * 300 Army Postal Service (APS) personnel set off with the British Expeditionary Force (BEF) in 1914. By the end of the war there were 4,000 of them spread around the conflict zones. * In December 1914 the Home Depot was built in Regents Park to sort the mail destined for the troops. It covered five acres and was the largest wooden structure in the world. Later on, due to the threat of Zeppelin attack, its services were spread out to depots such as Manchester and Leeds. * In 1917 around 57,000 official documents, and 320,000 letters, were posted daily from just one section of the BEF. * The Post Office’s ‘Returned Letter Office’ had only 25 staff dealing with all mail returned, marked ‘killed’, ‘missing’ or ‘prisoner’. 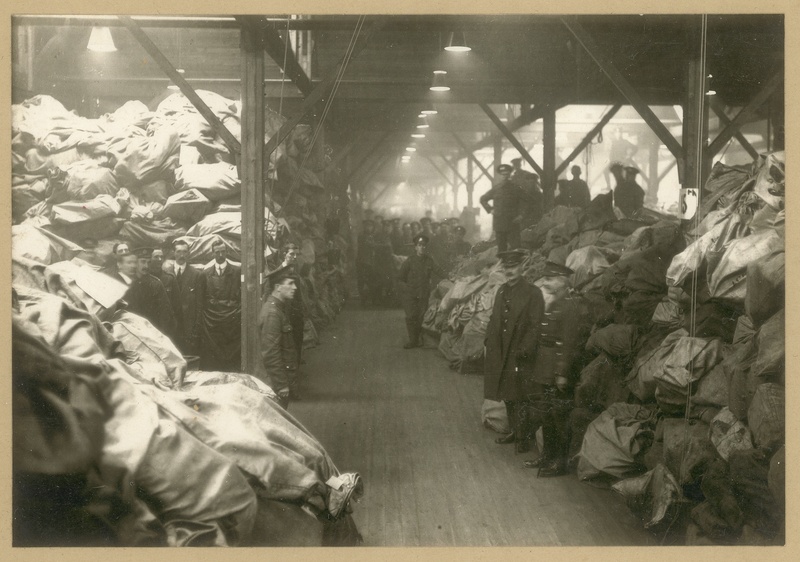 The office had to make sure that such mail did not reach next of kin before an official notification (after heavy fighting on the Front as many as 30,000 returned letters a day might come in). * Prisoners of war, thanks to an international agreement, were able to send and receive mail free of charge. * By 1918 20,000 bags of mail were shipped to France every day. * The same year, 1918, it was agreed that the postal charge should rise – it did, by half a penny to 1½ pence. Information on the Post Office during the First World War taken from a podcast by Peter Sutton on the British Postal Museum & Archive website – http://www.postalheritage.org.uk/page/3839/Podcast. This entry was posted in First World War, The UK, Zimbabwe and tagged British Expeditionary Force, Charles Furlong Wise, Christabel Wise, First World War, Home Depot, post office, Returned Letter Office. Bookmark the permalink.